To view and engage with the interactive map click here or the image below. 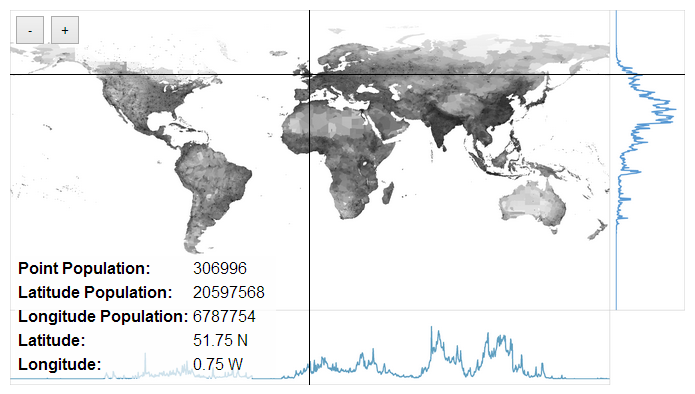 Screenshot of interactive map of world population by point, latitude, and longitude. I created this interactive map using the ISLSCP II Global Population of the World dataset, and a power scale image of this data from the ibbly.com article Where people live. Main inspiration is from Bill Rankin’s Population Histogram. I cite fair use with regard to any copyright issues of this derived work. The data is divided into 0.25 degree segments of the world’s surface, in total 720-by-1440 discreet areas. The map and the data might be not perfectly correlated, but should be within one degree or two of accuracy. The source code for this work can be found here.